And it’s Wednesday again. Can’t believe it will be only two weeks before I’ll go to Japan. One of the places I have to visit will be the Pokémon Center there in Tokyo. 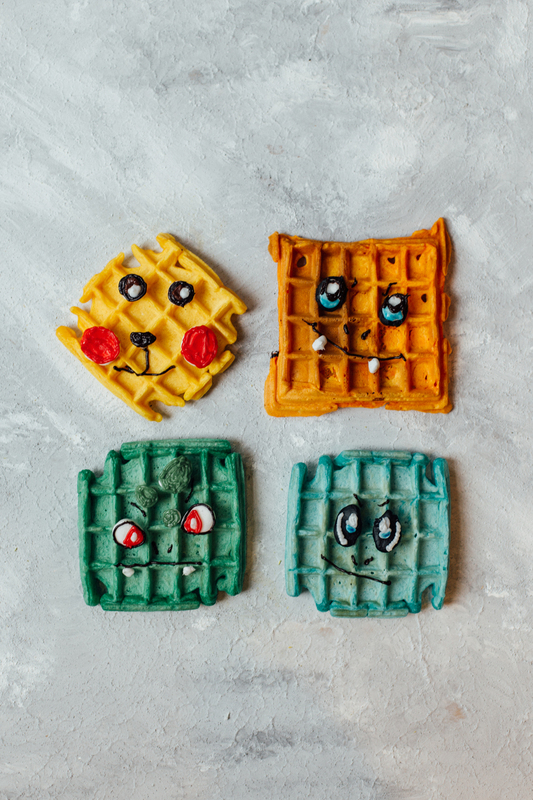 And since it’s also 21 years since the first Pokémon games I thought it would be nice to make a child-friendly waffle with a nice twist using some food colouring. 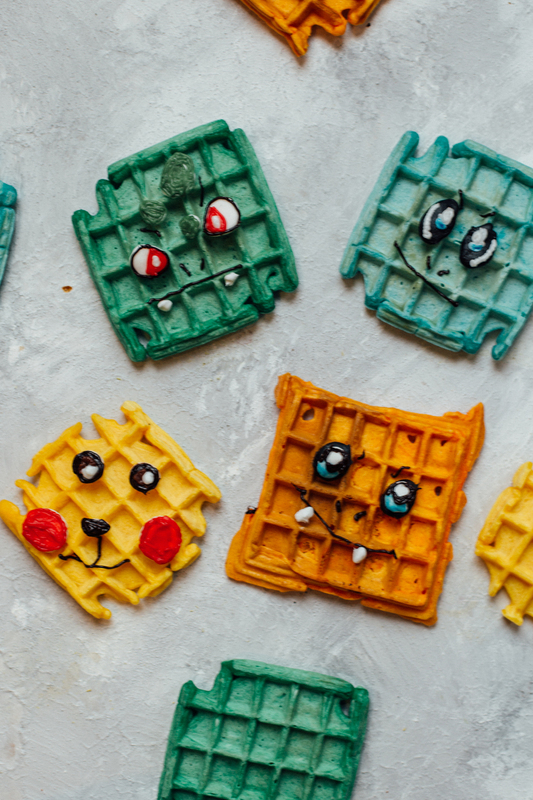 Also, this waffle doesn’t contain any sugar cause if you use sugar the waffle will brown which won’t work so well with some of the food colours. I’m quite shocked to find out that I’ve had waffles before which were bright green and so sweet so can hardly phantom how much food colouring they probably added. Most food colouring is safe to use, but I always try to balance food in moderation so therefore I came up with this recipe to make sure you only need a small amount of food colouring for the desired effect. Happy Wednesday guys! Mix together the flour, salt and baking soda in a bowl and mix. Add the eggs and buttermilk and stir till you get a firm dough. Divide the portions in the number of colour waffles you would like to make. I’ve made 4 different colours to make Bulbasaur, Charmander, Squirtle and Pikachu. 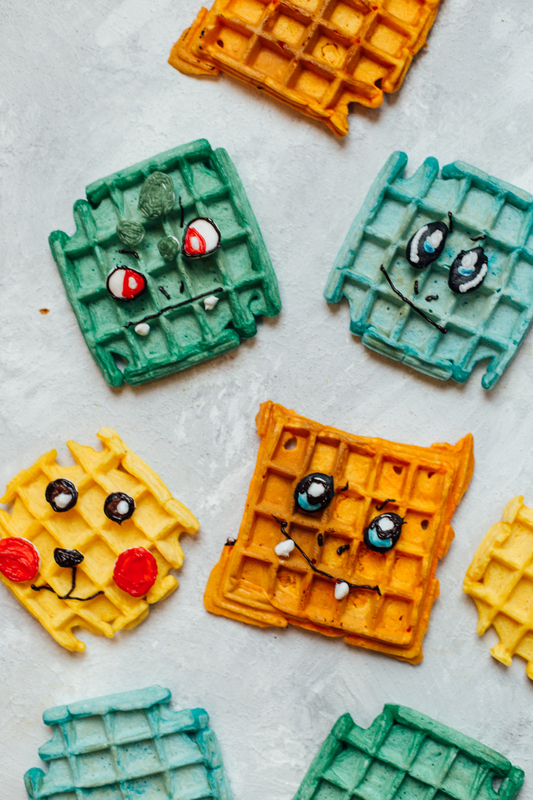 Decorate the waffles using fondant, marzipan or icing. I went for a mix of fondant for the eyes and used icing on top which was store-bought. Happy Waffle Wednesday guys!